I remember seeing this karnataka recipe on my great grand mother's recipe collection. wonder how she managed to get the traditional karnataka recipes without any cookbooks, visits to the state and all. 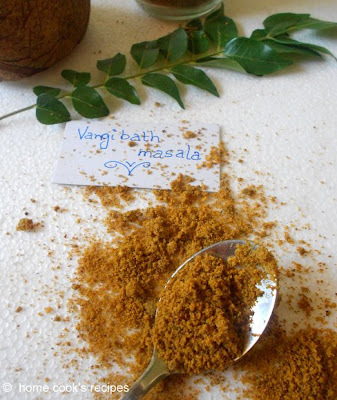 Home made vangi bath masala is full of flavors, i just loved the addition of dry coconut. this is the first time i used. the aroma and taste of kopparai thengaai contributing to the dish is too good. Dry roast the ingredients in medium flame one by one. start with chana dal, urad dal, dhania. then dry roast cumin, fenugreek, cinnamon and cloves, khasa-khasa. following roast the dry coconut in slow flame. then roast the dry red chillies, curry leaves and hing separately. Cool the roasted ingredients and using your mixie, make them into a fine powder. Store the vangi bath masala in an air tight jar. use it within a month, as it has dry coconut or store in your fridge. If you have masala. preparing vangi bath is easy and can be done in 10 minutes. This masala powder can also be used to make carrot rice and capsicum rice. Vangi bhath, i tasted it first at Mavalli Tiffin Rooms(MTR), from then i used to cook this vangi bhath once in a week. Vangi bath is truly addictive for brinjal lovers. so going ahead with a warning...I used to cook vangi bath atleast once in a week, when we were in bangalore using MTR vangi bath masala. Soak the basmati rice for about 20 minutes in sufficient water, drain the water and cook basmati rice with 1 and half cup's of water. i used my microwave and cooked in 1 and half cup's of water for about 12 minutes at 900w. rice and water ratio is 1: 1 and 1/2. you can cook the rice on stove top with the same ratio. cool the cooked basmati rice in a wide bowl. mix 1 tsp of sesame oil to the rice and give a soft stir with the spoon, so that the grains are separate. 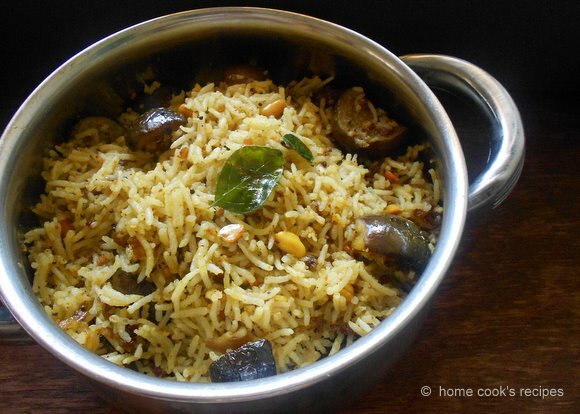 Chop Brinjal's into big chunks and let them be in a cup of water, to avoid darkening. In a pan, start for tempering, heat 3 tbsp's of oil, add mustard and let it splutter, add chana dal, urad dal, cashews, peanuts, dry red chillies one by one and roast them all till they turn into light golden in color. add curry leaves. Add finely chopped onions and saute till they turn translucent. then add chopped brinjal and fry it in medium flame. add salt and turmeric powder and roast the brinjal. add little oil, if they start sticking to the pan. 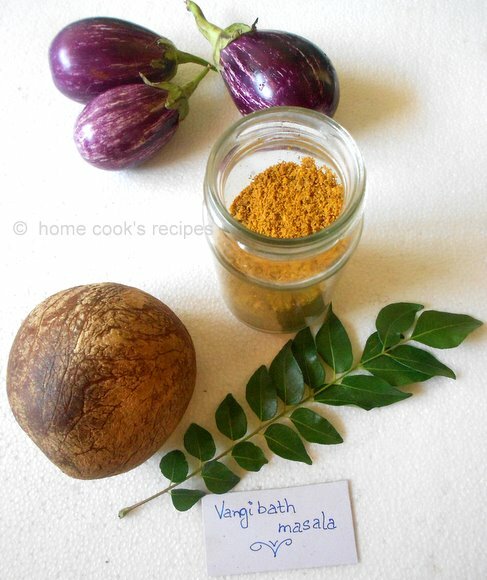 Now add vangi bath masala powder to the brinjal's and give a good mix. 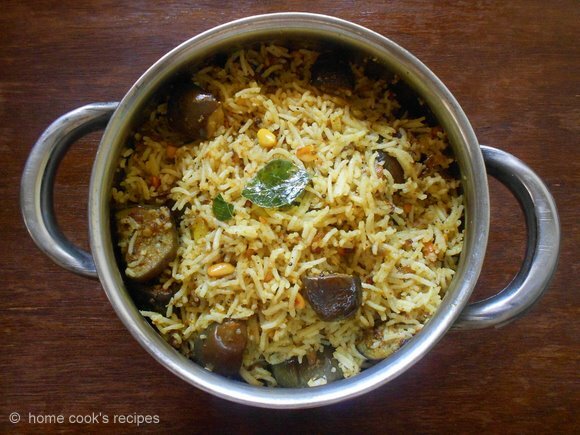 turn the flame to slow and close the pan with a lid, and let the brinjal's get cooked along with the masala. 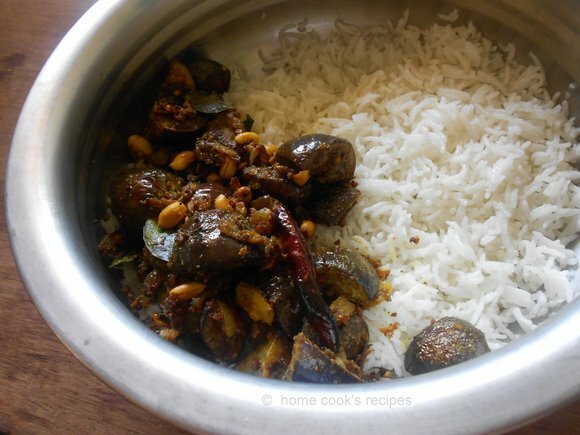 Brinjal gets cooked within 10 minutes. remove from the flame and transfer to the bowl of cooled basmati rice. slowly mix the masal's with the rice. Garnish with chopped corriander leaves and 1 tsp of dessicated dry coconut. Serve warm with onion raita. Using onions is optional. this tastes good even without onions. You can add tamarind while adding vangi bath masala powder, only if you love little tangy flavoured vangi bath. If you tell any kannadiga, that you made vangi bath with MTR vangi bath masala mix, they will give you a weird look. iam telling you this from my experience. they always trust their home made masala. iam happy, finally i made my own masala! My very very favorite one. Way too tempting. Vangi bath looks amazingly delicious . Each grain looks so distinct. I love vangi bath. My sister used to make it all the time for me. Awesome recipe shared here hope it's taste is also good..
Super post, I am craving for vangi bath now! Love the little changes in you blog lavi! Thanks Raks for your appreciation! Delicious Vaangi bath.. I love it!! Nalla recipe, Lavi :) I always buy Vangi bhath MTR masala. This should really be flavourful, nothing like homemade powders! Nankhatai and carrot cake with forsting are outta the world! bookmarked both!! Bharathy, even when i made second time, i was not confident. after 2nd and 3rd sothapals, i got it right! iam sure you will not go wrong! Very mouthwatering. Nice recipe. Looks so good. YUM! Looks so tempting.... I wish I could try this one! You are most welcome any time... Love to subscribe to your blog.